Heading to the Alfie tribute game on December 4? Here's a sneak peek at what you might be able to expect. My source tells me this is a "very early" draft. He couldn't confirm whose edit marks and annotations are on this copy but he assures me this is a legit draft that reached high levels of the organization. Sens Army! Tonight... we celebrate... (mic should cut out here, for nostalgia reasons). Tonight... we honour... our captain! Well, our former captain! And not the one we traded to Dallas. The one before that! I call on all of you... to stand up... even if you aren't in that cool new Red Scarf Union section... and cheer him on to victory! Well, not him. Because he doesn't play here anymore. But his FORMER team! Rise up! Rise up and welcome our true hero!! And also your Ottawa Senators!! 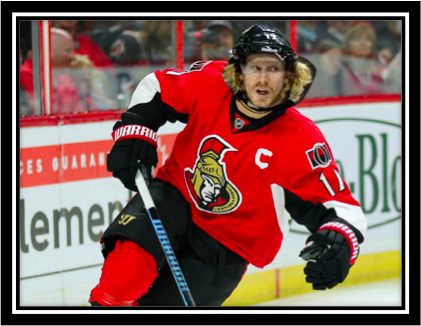 Sens fans, please turn your attention to the Bell HD screen for a special video tribute to your favourite Swedish captain. We'd like to invite Daniel and his family to join us at centre ice for the presentation of a special gift from Mr. Melnyk and the Ottawa Senators Hockey Club. "Uh guys, I think Alfie shoots right..."
(Ed. note: Alfie needs five pucks in total, one for him and one for each of his sons. Five seems pretty steep so we're offering him three. He says Detroit offered him a ceremony with five but I think he's bluffing). Now, will Ottawa Senators' captains Erik Karlsson, Chris Neil and Chris Phillips, and Islanders captain John Tavares please come to centre ice for the ceremonial faceoff. And of course, tonight is a family affair. Joining Daniel Alfredsson are his sons: Hugo, Loui, Fenix and William. Joining Chris Neil are his kids: Hailey, Cole and Finn. Joining Chris Phillips are his kids: Ben, Niomi, Zowie and Curtis. And joining Erik Karlsson is that Swedish guy that took over his instagram last summer. Now please rise and join retired OPP Constable Lyndon Slewidge, as he performs the Star Spangled Banner, O' Canada and - as a special tribute - ABBA's "Dancing Queen," the national anthem of Sweden.